Gunsmoke’s Gun for Hire Marshal Matt Dillon’s Colt sells high among the classic movie collectibles at High Noon’s auction. 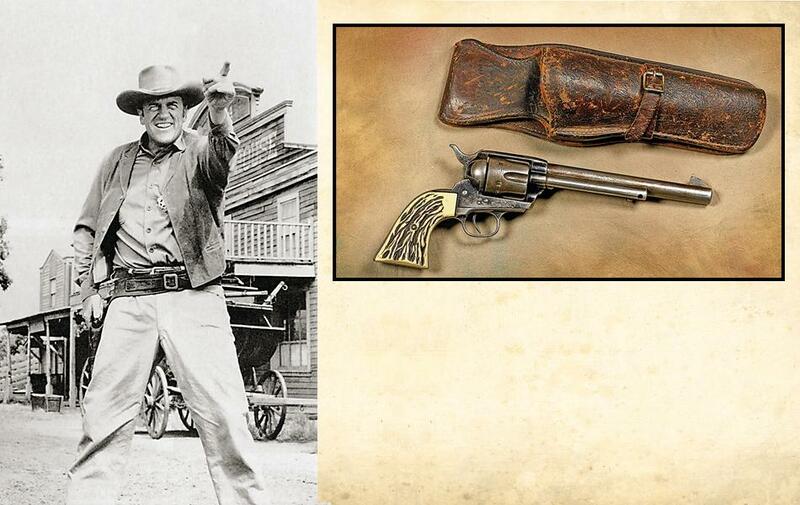 The U.S. Army’s sidearm of choice from 1873 to 1892, the Colt.45 single action Army revolver, found new fans when Marshal Matt Dillon, played by James Arness, wielded one on the CBS Gunsmoke series that ran for 20 seasons from 1955 to 1975. Not surprising then that one of his Colts from the popular series came out as the top Hollywood collectible lot at High Noon, bidding in at $50,000. 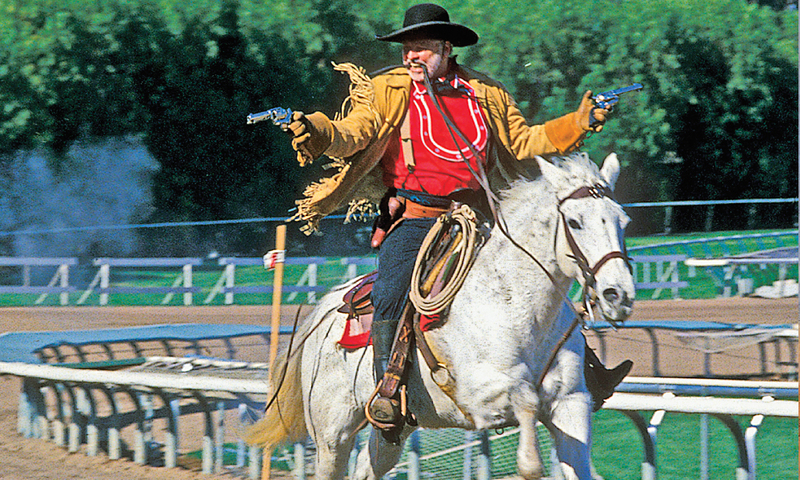 Hollywood has had a love affair with Colt since the release of the first film credited with beginning the motion picture industry; the ending of that film, 1903’s The Great Train Robbery, was made memorable by the outlaw gang leader firing several shots of his Colt 1892 double action at the camera. One of the bandits also carried a Colt, a single action Army with a 7½-inch barrel known as the “Cavalry” model. Another 7½-inch barrel revolver would bring Colt back into popularity, after Colt stopped manufacturing the single action Army in 1941. Stembridge Gun Rentals blued a number of these for Gunsmoke. 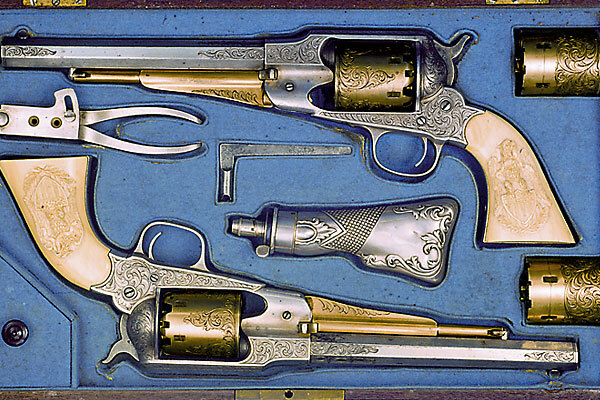 The production company rented several Colt revolvers for Arness during his 20-year run, and this particular one was noted in the Stembridge records as being rented to the show in 1961. Gunsmoke and firearms aficionados may also remember Dillon using a Great Western revolver. That was true, in the early part of the series. After contacting Colt and finding out the company had no plans to resurrect the single action Army, Bill Wilson and partners formed the Great Western Arms Company in 1954 and reproduced an almost-exact clone to be used in Western movies and TV shows, including Gunsmoke. Two years after the Great Western was introduced, Colt brought back the single action Army, and the company, unable to beat the real deal, finally folded in 1962. Even so, John Wayne brought Great Western back to the big screen, when he used the single action Army as his main handgun in 1976’s The Shootist. His saddle from that film sold at High Noon as well. Fans may also be familiar with another Arness Colt used in the series, showcased at the Buffalo Bill Center of the West in Cody, Wyoming. That Colt .45 is on loan from the Tibbals family and features the serial no. 215596. Arvo Ojala, who made the holster accompanying the gun, was a famous quick draw coach for Hollywood stars, but Gunsmoke fans will recognize him most as the unnamed man shot by Marshal Dillon in the opening sequences. 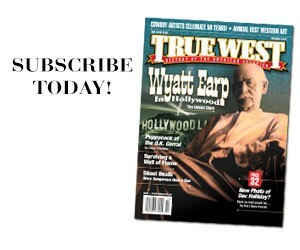 Collectors made more than $1.3 million selling their Western memorabilia at High Noon’s auction. James Arness carried this Colt .45 (serial no. 147056) in his role as Marshal Matt Dillon on the popular CBS Gunsmoke series. 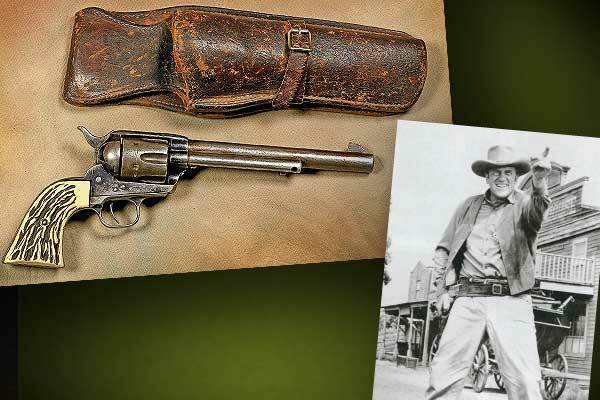 The top-selling movie collectible bid on at High Noon’s auction, the Gunsmoke Colt and an Arvo Ojala-crafted holster hammered in at $50,000. 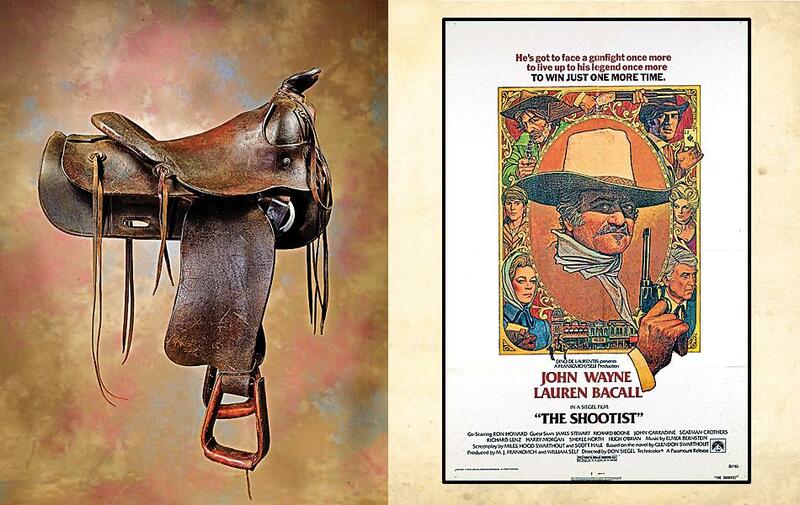 Ridden by John Wayne in his final film, while portraying a gunfighter battling cancer, this movie saddle from 1976’s The Shootist hit collectors in the hearts, since the Duke would soon be battling the cancer that cost him his life in 1979; $8,000. Two posters promoting the film (one shown) bid in at $400. 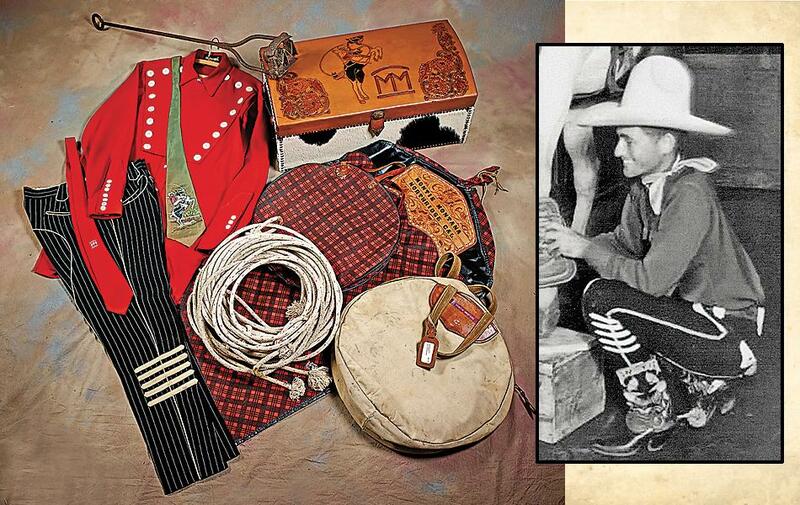 The top lot for B-Western actor and rodeo performer Montie Montana was his hand-carved trunk sold with MM- or Montie-branded ties, a branding iron and a canvas rope bag with one of his trick roping ropes. Also included were his red Manuel shirt and black-striped pants with piping and coups stripes; $4,250. 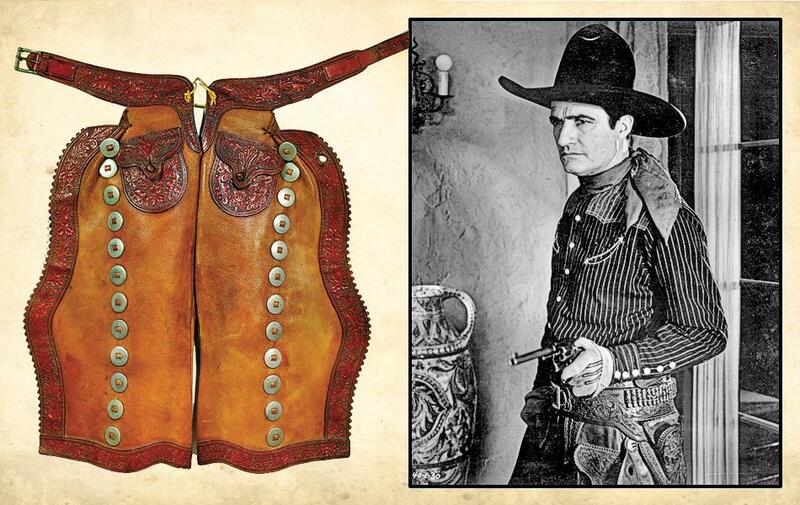 Known to wear his chaps high and tight, binding them through a laced hole on the outer batwing (see photo), Tom Mix gave his California batwing chaps to Robert Cobb, cofounder of Hollywood’s legendary Brown Derby restaurant, frequented by the cowboy actor, among other A-listers; $25,000. Got a Spare? Did frontiersmen carry spare cylinders into the eras of percussion and metallic cartridge revolvers? Billy the Kid Stays in the States! 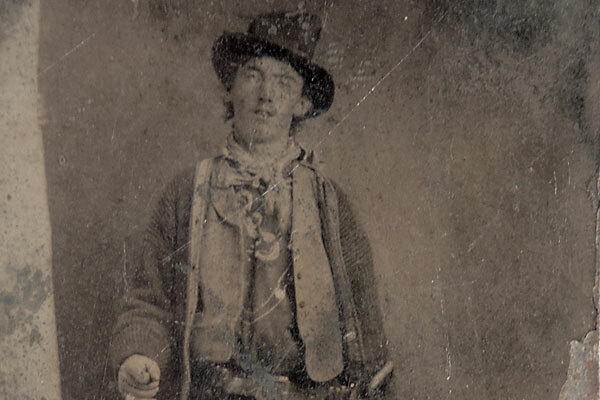 Find out which outlaw debacle is among the reasons why the tintype’s new owner is such an avid collector of the West.